1. What does it really mean? 2. How does it really work? The term “differentiate” is defined by dictionary.com as “to form or mark differently from other such things; distinguish”. As a brand positioning specialist, I define “differentiate” as a means of distinguishing one’s business over its competition. The most important aspect each definition communicates is the need to look at the other guys in your space and find out what makes them special/unique. You then want to do the same with your own business and then compare. This keeps you from hanging your hat on the same hook as the other providers in your space. By comparing your business to your competitors, you can identify key positioning niches that you can claim independently of the other companies. By right, you are then differentiated – as long as the niche(s) you choose is/are distinguishing. There are an infinite number of differentiation areas a small business can choose, depending upon the particular target buyer, the vertical industry, the solutions being offered, and so on. 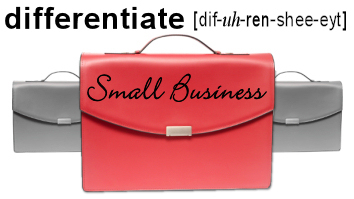 For the purpose of this piece I am selecting about 15 effective ways to differentiate a business. This is based largely on the many brand positioning programs I have worked on for clients. Also, please note the important characteristic they all share – they can and should be substantiated with proof. 1. Number one or the largest – There are a number of ways to define the distinction as the number one provider in a given industry segment. You can base it on the highest revenue or market cap, the most number of customers, the largest staff, the most offices, etc. 2. Percentage or amount of repeat business – some companies will claim to have the highest customer satisfaction in their industry because 98 percent of their clients, for instance, recommend them to others; or because almost all of their clients use them again. 3. Customer satisfaction – Aside from the explanation in number 4 above, customer satisfaction can also be a claim a business makes as the result of a customer satisfaction survey it conducted. There is obviously a lot of leeway for contrived interpretation since your business is the one conducting the survey. Nonetheless, however, it is a claim based on a survey. 4. Number of clients in one business segment – If you are a business consultant and you have 48 customers and 43 of them are law firms, you can likely claim the distinction as the number one small business consultant focused primarily on law firms. This is of course only possible if your positioning comparison indicates no other consultant has made such a claim. 5. Most cost effective (aka the cheapest) – In some industries this market position makes sense. In others it does not. 6. Most comprehensive – If you are casting yourself as a “one stop shop” in your industry and offer the broadest set of products/services, then this is a very viable positioning stance to take. 7. First or longest standing – While the Internet era has made it cool to be a fresh, new business on the scene, there is still something special about claiming to be the first provider in the industry or the longest standing. 8. Specific features/functionality – so many businesses today try to distinguish their business based on the attributes of their offerings (e.g. we have the most number of stripes on our widget). This is a dangerous position to claim because you really never know where your competitors are in their development efforts. They might be just 2 weeks behind and about ready to come out with a widget that has more stripes. These are just some of the ineffective positioning niches that I try to avoid at all costs. Trust me, there are so many more. 22 year B2B marketing professional with a specialty in helping businesses differentiate themselves. Kevin has helped over 100 companies successfully distinguish themselves in their marketplace through brand positioning programs and professional copywriting services. Customer service and support seem to be lacking in nearly all online businesses. Unless you are selling swamp land in Arizona, customer service and support should always be out front. A great marketing plan or an awesome product are useless if your customer is not happy. Be the company that will go to the moon and back for any customer and you will stand out from the crowd. Worry about the rest after you have happy customers. @JohnMcDuffie I think saying that of “nearly all online businesses” is painting with a very wide brush. In the 12 years of rubbing shoulders with small business owners who are 100% online, it is my experience they truly care. Are there shysters and hucksters? Sure there are. And truthfully, we can all spot those a mile away. But the ones I seem to come in contact the most are today’s version of the ‘mom and pop’ businesses. Many struggle to balance family life with running a business and often spend sleepless nights over just ONE unsatisfied customer. Many times they don’t have the resources to answer emails 24 hours a day, 7 days a week or answer phone calls before the 3rd ring. That’s not an excuse for poor service of course. Service should be given within a reasonable time frame and if customer service is a stumbling block then we should get help and have that help be in charge of customer service. There are also many other things one can and should do like have a standard plan for what to do with an unhappy customer to attempt to turn things around. Thanks for the tips & tricks, Kevin! Differentiating your business is difficult, but I believe once you find that aspects of your business that generates sales and repeat customers, you have to run with it and expand on it. This article is a great breakdown on what else to take note of! Once you break it down, it times to market and sell it. It’s all about differentiating your company from the pack. Far too many start-ups are “me too” businesses. You’ve said it wonderfully … we’re going to pass this on to our clients. Thnx!